You pay your bill, the cashier hands you the receipt and more times than not will inform you about the customer satisfaction survey on the back.....you walk out to your car thinking....I wonder if people ever fill these out and win? You tell yourself I think I will do this one and see! ...The receipt goes in your wallet and never comes out again! Sound familiar? On the back of almost all our receipts, there is a survey or coupon offer. Completing them only takes a few minutes of online time and you can't win if you don't enter. Prizes from these customer satisfaction receipt survey's can be gift cards for free grocery's, free gas cards, free food, and coupons mailed to you throughout the year. When you factor in how many receipts you see on the ground outside a grocery store and how many people forget to actually do the survey....your odds seem pretty good. 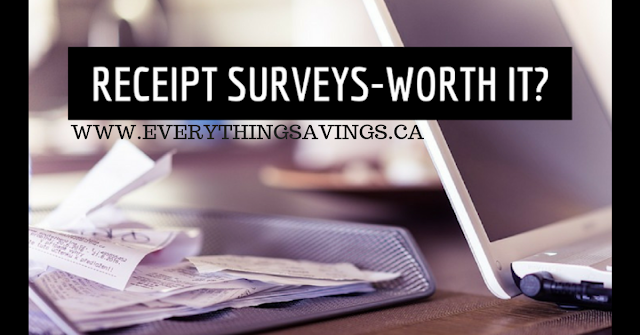 Think of the survey on your receipt as a free lottery ticket. If you were handed a lottery ticket for free as you checked out of a store you would definitely take the time to check if you were a winner...Take the few minutes to fill out the survey's on your receipt and you just may win yourself $1000's, free food and other great prizes. You don't even need to have a receipt now for some of these grocery receipt contests. With every survey you complete you get an entry into winning cash prizes for free groceries. Winners are posted so you can see who is winning monthly.